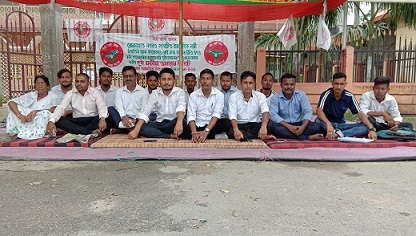 The Bokakhat unit of the All Assam Students’ Union (AASU) on Monday staged a two-hour sit-in demonstration protesting crimes against women that have taken place in Bokakhat sub-division under Golaghat district recently. The protestors demanded exemplary punishment to the culprits involved in molestation cases. As per reports, Mintu Kumar Nath, whose name was involved in the suicide case of the wife of one Nipen Kalita, was sent to jail while Tirtha Sarma, who was allegedly involved in a sexual harassment case, was also sent to jail following their arrest by Bokakhat Police. Nipen Kalita has been working as a night watchman in the Bokakhat Sub-divisional Police Station. On the other hand, the Bokakhat unit of AASU expressed anguish at the Bokakhat Police for not being able to nab the culprits till date who were involved in the murder of one Maiti Pegu at Anandapur Tea Estate in Bokakhat on June 6, 2018. The protestors demanded immediate arrest of the murderers. The protestors also submitted a memorandum, which was addressed to Assam Chief Minister Sarbananda Sonowal, before the Bokakhat SDO, demanding necessary action to prevent crimes against women.